The hours that followed were tense ones, as recriminations flew through the air between Moscow and Novotny. Moscow accused Novotny of not having Thor. Novotny's reply was quite reasonable, asking where the Kremlin wanted to see it demonstrated. Moscow replied that they were not interested in Novotny's braggadocio. "Oh," said Perlin, reading the transcript of that exchange. "I do not feel good about this." Perlin's foreboding was justified. By Eleven o'clock, he had delivered to him a news bulletin, and a new batch of transcripts. He read them over, looking grim, and looked to Bond and Leiter. "The sonofabitch has done it," he said, quietly. "SATINT shows that a decommissioned Soviet battleship, the Tsiolkovsky, sitting in mothballs at Vladivostok, suddenly experienced a highly energetic, highly localized explosion amidships. She broke in two, and went down - as far as possible in that harbor -- in a space of about ten minutes. Now the Russkis are offering Novotny two million. Novotny has said he wants it, cash in hand, by five tomorrow morning. Moscow's falling all over themselves to agree." Leiter smiled grimly. "I'll bet they are. That gives us the break we need. We've got six hours." "But we won't need them," Bond said, quickly. "We've been assuming that Novotny's signals are being relayed to the Soviet satellite, and that he could be anywhere, using commercial communications - telephone, short wave, what-have-you." "I guarantee he isn't controlling Thor from a phone booth!" Bond stood. "He's somewhere with computers and a satellite uplink." Bond was jarred from his reverie by the word, carved on the front of a newish building seen past Felix Leiter's profile, outside the window of his Cadillac. Below, in smaller letters, were the words "Town Offices." The sky had darkened into a soft pastel purple, and long shadows fell from the pines and maples onto the unselfconsciously picturesque New England architecture. This Berlin had the unmistakable air of a town that had seen better days, but for all that it was charming, and quite beautiful. "What the hell, Felix?" asked Bond. "Berlin?" "I thought you'd noticed that when we turned off the highway," Leiter replied. "I thought it was getting on towards time to eat, and you know how I like to find new places. I saw the name of this town on the exit sign, and since we were talking about that Thor Fiasco, I thought, `What the hell?'" The tiny collection of buildings that constituted "downtown" had disappeared behind them, without a restaurant in sight, and Felix sighed, looking around for a suitable side street. The Cadillac rattled over a railroad crossing, and Felix turned right immediately thereafter, and drove on up this road, parallel to the tracks. Bond knew that Felix was looking for a parallel road to return to the highway. Like all secret agents, he disliked doubling back over his own course, giving someone an extra chance to see him, remember him, identify him. Suddenly Leiter braked, and pulled toward the side of the road, pointing ahead of him. "For God's sake!" he exclaimed. "Would you look at that!" The red-and-white striped barricades raised where the side street crossed the tracks stood in nicely for those -- so damnably fresh in James Bond's memory -- beside which he and Felix Leiter had spent such a frustrating two days, fifteen years before. Over the entrance to the car-park was another sign: "You Are Now Leaving The American Sector." "Good Grief," said Bond. He looked for a long moment at Leiter, who shook his head slowly, with a rueful smile. "James," said Leiter, after a moment, "I don't think, in good conscience, we can eat anywhere else tonight. Not under the circumstances." James Bond was forced to agree. Felix pulled into the car-park, and they stepped to the door of the nightclub, and then through it, into another world. The club was dark, with a spotlit stage on one end. There was an old-fashioned Jazz Trio ("The Buddy Short Trio" advertised a sign on the base drum that supported a single snare drum and a high-hat cymbal, framed on one side by an upright base and the other by a shirtsleeved singer -- presumably, Mr. Short -- at a 1950's-vintage microphone) performing a smooth, upbeat version of Sinatra's "The Coffee Song." A waiter showed them to a corner table, and there they ordered one of the finest meals James Bond had ever eaten in America. His steak was juicy and tender, the portabella mushrooms firm and tangy, the mashed potatoes expertly seasoned, and the dinner rolls fresh-baked and fragrant. Leiter's swordfish looked and smelled equally worthy, and the bartender made as fine a martini -- shaken, of course, not stirred - as James Bond had ever had. Between bites, Bond picked up his narrative. It was Corporal Lansing who finally gave them the key. Perlin had called out for coffee at midnight, as Bond and Leiter made a survey of possible sites for Novotny's `control center.' Thus far, every installation they'd been able to find in West Berlin that possessed both satellite and computer facilities was military and allied, and all were secure. If Novotny had pentrated one, it was with the help of an insider, and there was nothing to point to any of them. Lansing had arrived with the much-needed coffee in time to hear Felix grumble, as he scanned yet another list, "How many places can there be in this town with both computers and a satellite link?" "Like TV stations?" asked Lansing, and Bond at Leiter looked at one another. "F.A.B.!" they cried in unison. Perlin looked over at them. "F.A.B.?" "Fehrnsehen Aus Berlin," supplied Lansing. "It's a TV station. They're putting an addition on the building. I go by it every time I go to the music store where I get my Jazz records. Big old satellite dish on the roof." Bond and Leiter smiled grimly. The construction was the key. Construction sites uniformly made a great show of security, and were uniformly poor at it, because the security aimed to keep the public away from the construction equipment and other hazards, rather than to protect the sites. There were probably half-a-dozen ways that Novotny could have snuck into the operating part of the building. The hole Bond had expected in the fence was there, toward the southern end, no doubt pried there by children unable to resist the allure of heavy machinery. He and Leiter crept through and approached the building proper. Two of the doors facing the construction were gone, covered instead by thick clear plastic sheets. Bond lifted one, and gestured Leiter through it. Once inside they found themselves in a darkened corridor. Bond pointed at Felix, and then to the left; to himself and to the right. Leiter nodded. The plans for the new building they'd reviewed at Perlin's office had showed two possible target sites, two "control rooms," on opposite sides of the original structure. The original, still in operational use, was on one end. The new one, to which the operations were moving, was on the second floor of other. Bond, his Walther PPK held comfortably in his right hand, stepped quietly down the hallway, listening at silent doors, and moving on to the stairwell at the end of the corridor. He started up the stairs, his rubber-soled shoes making no sound. This was greatly assisted by the building itself. Bond quite preferred commercial buildings when stealthy movement was required: steel and concrete stairs and floors didn't creak and squeal an alarm at one's approach. He eased open the door from the second-floor landing, and made his silent way down the corridor. The flickering blue light of television or computer monitors spilled out of an open door. Bond smiled. After a day of fruitless searching, it had become easy to think of Novotny, with his mocking eyes and quirky, humorous mouth, as something of a mastermind. But the man wasn't a secret agent, he was a scientist, and the opening door with its flickering light reassured Bond. The man was an amateur. Bond moved to the door and peered around the frame. The far end of the room was a bank of monitors, television and computer alike. One of the computers -- a box three feet by four -- had been pulled out of its alcove in the wall, and opened. Wires ran from it to a makeshift rack, which stood empty on the counter. In front of this stood a man with a crew cut, dressed in a common-enough light-grey business suit. He snapped shut the fasteners of a large, pigskin briefcase, and looked at his watch. Bond lifted his gun, and stepped into the room. "Doctor Novotny." The man turned, and Bond recognized those mocking eyes, the quirk of the mouth. "You're English," Novotny said. "I expected an American." "There'll be one along soon enough," said Bond. Novotny shrugged, and stepped towards him, pulling the briefcase casually from the counter. Bond wasn't prepared for what happened next. Novotny's expression never hardened, never flickered, but suddenly the case was swinging in a blindingly swift underhanded blow that smashed like a sledge hammer into Bond's wrist. Pain flared like a red explosion up his arm, and the PPK flew into a dark corner of the room, as Novotny danced past him into the corridor and ran for the far end. Bond dove for his gun, but it skittered away from his reaching fingers, and under the counter. No time, he told himself, and bolted out the door, but Novotny was too quick, Bond too many steps behind. As he reached the windows at the end Novotny spun in an odd pirouette, swinging the case around himself. It crashed against the re-enforced safety glass of the window, which sprayed out into the night in a glittering halo. However innocuous that case looked it was far heavier, and more solid, than it should be. The hard drive! Bond realized it in a flash of insight as he dove for the man. But Novotny had too good of a lead, and had leaped from the window before Bond's dive brought him within reach. Bond rolled to his feet, and looked out the window. Novotny had landed on the roof of the scaffolding over the rear doors, and was sprinting along it. Bond jumped from the window and landed behind him. The weight Novotny was carrying began to tell, and Bond closed on him. Desperate, Novotny leaped sideways, to the metal roof over the cab of a bulldozer. He saw Bond preparing to follow and jumped again, this time onto the rear cowling of the crane. Bond landed on the bulldozer, and Novotny turned to the latticework of the crane's construction and began to climb up, scurrying like a monkey, trailing the heavy case behind him. Bond leaped to the crane, and climbed into the cabin. It was a much more modern crane than he'd seen those years ago on Crab Key, but he found it was easy enough to start the beast up, and, after he turned on every "power" lever he could find, the controls were obvious enough for turning and moving it. But there was nothing he could do, other than make sure it didn't provide Novotny an easy bridge to escape. He rotated the crane so that the boom, rather than being over the roof of the building, pointed out over the flat concrete and protruding steel rods of the new car-park like a helpful giant giving directions, the huge magnet swinging from the end like a yo-yo on the pointing finger. Novotny had frozen where he was while the crane was moving, but once it stopped, he resumed his desperate climb. "Novotny!" Bond yelled. "Give it up, you damned fool! You've nowhere to go." But Novotny continued to climb, and, with a weary swear, Bond began to clamber up after him. The heavy case still slowed Novotny down and Bond gained steadily on him as he fled. At the top of the crane, Novotny began to make his way out along gently swaying arm. Bond followed. The wind was hardly fierce -- at ground level one would barely have noticed it -- but being atop a hundred-foot crane it felt like a gale. Bond watched Novotny sway with the weight of the case, totter for a moment, and regain his footing. He continued to scurry away from Bond, down the arm. Bond followed grimly, at an advantage because he could use both hands to grip parts of the crane, and steady himself. Novotny reached the end of the arm and stopped, looking back at Bond. Bond reached a hand out to him. "For God's sake, Novotny! Where are you going to go?" He came closer, and Novotny swung the case at him again. Bond ducked back, and his balance shifted. Suddenly the chase was forgotten, his arms pinwheeling for balance. At the end of the arm, Novotny did the same, the case's weight having built up more inertia than he was ready for. As Bond regained his balance, Novotny lost his, and fell sidewise from the arm of the crane. Bond made an insane leap to the end of the crane, and peered over the side, expecting to see a crumpled body a hundred feet below. But barely ten feet down, Novotny was clinging to the cables, shinnying down toward the six-foot disk of the magnet. Bond swore again. "Novotny!" He grasped the edge of the swaying arm of the crane, and swung himself down, wrapping his legs around the cable just above Novotny's head. Novotny loosened his grip slightly and began to slide down the cable. Bond closed the distance between them. Novotny's feet came to rest on the magnet's upper cover, and he grasped the cable with his right hand and swung the case as hard as he could at Bond's head. Bond was only a couple of feet above the swaying disk, but it was too great a distance, too unsteady a landing, for Bond to simply let go of the cables. He tried to fend off the blow with his right arm, but only deflected it. The heavy case grazed the back of his head, and red light exploded across his vision. His left arm fell away from the cable and he felt his feet touch down on the magnet, as he overbalanced backwards. He swung his hand out desperately, snagged the cable again and clutched it with mad determination. From the corner of his eye, he saw the case swinging toward him again, and he lashed out with his free hand, past the body of the case, and toward the handle. Novotny hadn't anticipated the move, and he had no time to adjust for it. Bond grabbed the handle with two fingers, and pulled with all his strength, and, at exactly that moment, floodlights sprang up from the construction yard below -- somebody, possibly Felix, had heard the commotion and tried to illuminate it -- and Novotny's body slammed into his. Both their hands loosed from the cable, and, suddenly dazzled, they careened backward into space. As is so frequently the case in moments of crisis and danger, Bond saw events moving in stately slow-motion, like an instant replay of a particularly interesting turn in a ballroom dancing competition. He saw Novotny, his eyes still mocking, the floodlights reflected in their depths, open his smirking mouth to scream. He saw the sky pinwheeling beyond him, saw his own hand holding the handle of the briefcase while Novotny's slipped away. Some peripheral sense made him aware that his head was rotating toward the magnet, and he desperately swung the case up against the bottom of it. There was a CLANG! and the case held against the bottom, Bond dangling from the handle. James Bond would for the rest of his life remember the elation of knowing he'd saved not only his own life, but the precious hard drive, as well. Then Novotny's scream cut off suddenly, in a sound that was thump and gurgle and something else, a tearing-gristle sound of the butcher's shop. Bond couldn't look down yet. He swung his other hand up to grip the handle, and then, hanging like a circus daredevil on the world's smallest trapeze, he steeled himself, and looked for Novotny. The scientist had dropped some sixty-five or seventy feet, and landed on two of the steel rods that would soon be encased in concrete at the base of a light-post. One protruded from the ruin of his neck, the other from just beside his spine. A scarlet puddle of blood was spreading beneath what had, a moment before, been a brilliant scientist. Now it was so much carrion. "James!" Bond heard Felix Leiter's voice. "Hold on!" "I'd no intention of doing anything else," Bond called. He looked around, and saw Felix climbing into the cab of the crane. After a few false starts, the magnet began to lower slowly, gracefully, toward the ground. Bond watched Novotny's corpse rise toward him, and swung his feet around it, to gain purchase on solid ground as the magnet jerked to a halt. The grunt of the crane's engine died away. Bond released the handle of the case and stepped back. "Felix!" he yelled. "You can turn the magnet off!" "I already did," the Texan replied, as he clambered from the cab. He loped towards Bond. "It's going to take a team of specialists with plastic crowbars to get that thing off of there. The damned thing's a permanent electromagnet!" Bond looked up at the unassuming-looking briefcase. "Well," he told Felix, "at least I saved it, even if we didn't get Novotny." Felix closed his eyes and shook his head. "The hard drive's in there?" "James, do you know how a computer hard drive stores data?" "Well," said Bond, "I imagine it's rather like the way a floppy disk stores data." "I understand it's the same principle as..." Bond's voice trailed off. "Dammit!" "Yep," said Leiter, and smiled at his friend. "Same principle as magnetic tape." 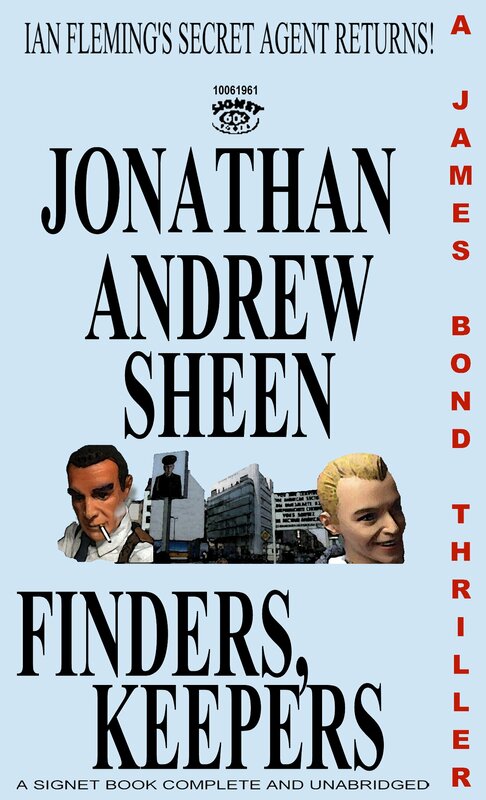 The next few hours were a nightmare of kindly solicitousness from Leiter and Perlin, and angry recriminations from M.
"That information was in only two places, 007," he barked over the phone. "The hard disk, and Novotny's brain. You've destroyed both of them!" "Well, sir," said Bond, "the Russians haven't got Thor either." "And that's your defense? 007, you've bungled this case from the moment you had it! There are two hundred and forty-nine of those damned things still circling above our heads! Sooner or later, they're bound to fall. And what then, 007? What then?" "Well," said Bond, sopping up the last of his gravy with a roll, "the most painful part of it all was that he was completely right, of course." He looked across the table at Leiter. "I know I made a lot of mistakes in the whole business, but the worst of them was going up that crane after Novotny. I should have listened to what I was yelling at him: where could he go? But I'd let the chase get to me by then, and it carried me away with it. Cost Novotny his life. Cost both of our countries... Well..." Bond looked up to the ceiling, and the sky above it. Leiter looked at him for a moment. "You're human, kid. There's not a one of us who hasn't fouled up something big." "Hell," said Bond, "if I'd just let the case fall with Novotny, the techs could have salvaged the data. I'll never forget hanging there, smug jackass that I was, proud of how I'd rescued the hard drive." He shook his head. "The only reason the Russians didn't win it all is because that first blind drop got fouled up." Felix Leiter took a swig of his beer, and scowled. "I've had it with this crap!" Leiter stood up at the table. "Where's the owner!" he bellowed. "I demand to see the owner!" "Felix?" James Bond looked up at his friend in surprise. He'd rarely had a meal as good, anywhere in the world. What could possibly be wrong? "I want the owner!" Felix bellowed again. "Bring me the owner!" Bond was starting to stand when he heard the soft, deep voice speak behind him. "Is there something I can do for you, Felix?" Bond turned, recognition dawning, as Leiter grinned. "Yeah," said the Texan. "You can tell my Limey friend here how you single-handedly won the Cold War!" Standing behind Bond, smiling, was Corporal David J. Lansing, USMC, Retired. He looked much as he had fifteen years before, large and powerful, with a gentle smile, and that sleepy, drooping eyelid. "I don't know what you mean, Felix," he said, smiling. "I was a lowly border guard at Checkpoint Charlie. Most heroic thing I did over there was pick up trash." Lansing's smile widened as he looked around the nightclub. On stage, the Buddy Short Trio began a new song. Short leaned into the microphone and crooned, "You're gonna go... Straight to the Top! You're gonna fly! You'll never stop! You're gonna win... You're gonna win!" "You know," said Lansing, as he sat down at the table with them, "It's amazing what you can find in the trash. People throw out the damnedest stuff! I heard a rumor -- just a rumor, now -- that a man found a McDonalds' bag full of cash money. A million bucks. Way I heard it, the man just put it away, and finished out his hitch. Went home, paid off his folks' house, bought one of his own, started his own business. I guess a million bucks could set you up real well. A good start, at least. 'Course, for any business to work out, it takes more than seed money. Takes location, and a good product, and a lot of hard work, and some imagination." Felix smiled. Bond returned the grin, and then turned back to Lansing. "Well, you certainly seem to have used plenty of both here, Corporal"
Lansing smiled. "Please. I'm Dave. And I thank you for the compliment. When I met Mr. Leiter in here a couple of months ago, he paid me the same one." Bond looked over at Felix. "All right," said Leiter. "I confess. I was working a Pinkerton job over in Clinton -- next town over. Some lunatic threatening to blow the dam. I told him that went out of style with tying widows to railroad tracks, and turned him over to the cops." Bond smiled. "I can just imagine what you thought when you saw this place." He turned back to Lansing. "But what about that story you were telling? Didn't that fellow think he ought to give the money back to its rightful owner?" Lansing shook his head. "Oh, I don't think so," he said. "If he'd worked at Charlie as long as I had, he'd've known that it's a full-time hangout for all manner of spies and smugglers and crooks. `Rightful Owner' was like as not some traitor, or somebody trying to bribe one. Maybe a drug dealer. I imagine that fellow thought the money was better off where it ended up. People who leave that kind of money lying around... It'd be like an international Super-Power leaving some top-secret weapon in orbit, waiting for some high-tech company over there on 495 -- like the place where my wife works -- to learn how to take control of it and use it to help the Kefiristanis seal off all those derelict nuclear missile siloes." Lansing clapped a hand on Bond's shoulder. "And after all," he laughed, "Every small child knows the rule: Finders, keepers!" Click the cover to see a gigantic version. Click here to download "Finders, Keepers" as an Adobe Acrobat Document in ".pdf" format! Click here to download "Finders, Keepers" as an e-book in ".prc" format! A very enjoyable Fleming pastiche. I do regret that Bond and Leiter weren't actually invited to a gay bar, or at least a transvestite one, given this is such a Berlin stalwart. :) Nice oc, too. Thanks for the kind words. I hadn't realized that Germans weren't allowed to cross at Checkpoint Charlie! That's interesting! I hope I got the rest of Berlin, if not "right," at least not embarrassingly wrong. I appreciate your stopping by to give it a read! Thanks!